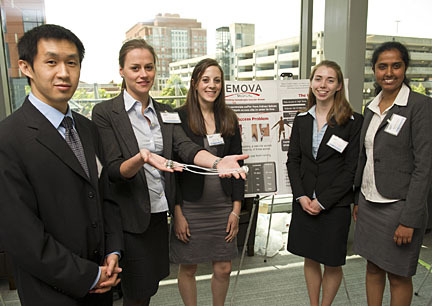 The Center of Bioengineering Innovation & Design at Johns Hopkins University has recently received the honor to boast the first place winner of the 2011 ASME IShow: a competition inspiring students to invest in their own innovation and entrepreneurialism to develop a sustainable business model of a medical, technological, or robotic nature. The first place prize, compromised of a $10,000 award, went to the Hemova Medical team of Johns Hopkins CBID. Hemova Medical, focusing on the medical component, designed a device meant to provide blood-cleansing dialysis treatment for kidney-failure patients. Implanted subdermally, this device is meant to reduce the three most common problems associated with dialysis-connecting techniques: risk of infection, clotting, and the narrowing of blood vessels. Nationally, there are over 300,000 people that receive kidney dialysis in order to survive. With current kidney-failure treatments, patients must undergo surgery to implant the blood-using devices that may fail in as little as one year. Not only does Medicare suffer $1 billion annually in new surgeries, but the patient morbidity is also increased. This new device presents the medical world with a new option that will save lives and a long-lasting connection to the blood cycling techniques.